The month of October is just getting started. The Cebu Teambuilding Facilitator’s Network is already fired up to facilitate programs to ignite team spirit. Last 2 October 2017, the facilitators of CTFN went to Lowaii Cebu Marine Resort to facilitate a team building program for Teradyne Philippines. The Teradyne team was a group of enthusiastic and energetic people. This is the 2nd program CTFN did for Teradyne Philippines in 2017. We kick start the day by stretching our muscles. Work tension was relieved with some tai chi. Before we officially started the program, the participants were asked about their goals. They were asked what they would like to achieve at the end of the seminar. The Teradyne team answered that they would like to improve their relationship with each other and establish good communication. To measure the team’s current level of communication and team dynamics, we let them do the Helium Ring. The participants were divided into three groups to perform the activity. The helium ring is one of the most challenging team building activities. It tested the group’s patience and coordination with each other. It took quite a while for the group to complete the activity. The participants tried to remain calm despite their frustration. Everyone in the group was pitching in ideas to finish the activity. They learned to be open to suggestions in order to come up with the most effective solution to their problems in the workplace. After a delicious lunch buffet, we continued the programs in the afternoon with a little ice breaker. The goal of the activity was to have the most followers by playing rock-paper-scissors. The participants showed their competitive spirit as they become the ultimate rock-paper-scissors champion. We continued in the afternoon with an activity called Moon Ball. The participants were divided into two groups. The aim of the activity was to tap the beach ball 120 times without letting it fall. The first group finished the activity in around 15 minutes while the other group finished in around 30 minutes. The first group immediately found the best way to effectively keep the ball in the air which is why they were able to finish it quickly. The second group admitted that they wanted to stick to the first strategy until they get used to it. Although the second group did the activity in a much longer time, they said that they were having so much fun. They didn’t mind about the other group finishing first. They learned that they need to be proactive in the group and not just go with the flow. After the challenging beach ball activity, the next activity was Kangaroo Hop. With the same group, participants were tasked to jump at least once in the jumping rope. Again, the first group finished quickly. The second group took a long time to finish. The participants learned that one simple mistake could result in jeopardizing team success. They cannot do things halfheartedly. One person’s mistake could become everyone’s mistake in the team. It is important that they help each other to avoid mistakes in the future. The day ended with the activity called Everybody Up. The objective of the activity is to stand as one with only their backs touching each other. Although they may belong in different departments or they may have different roles in the organization, they all belong in one organization: Teradyne Philippines. They share one mission, one vision, and one goal. 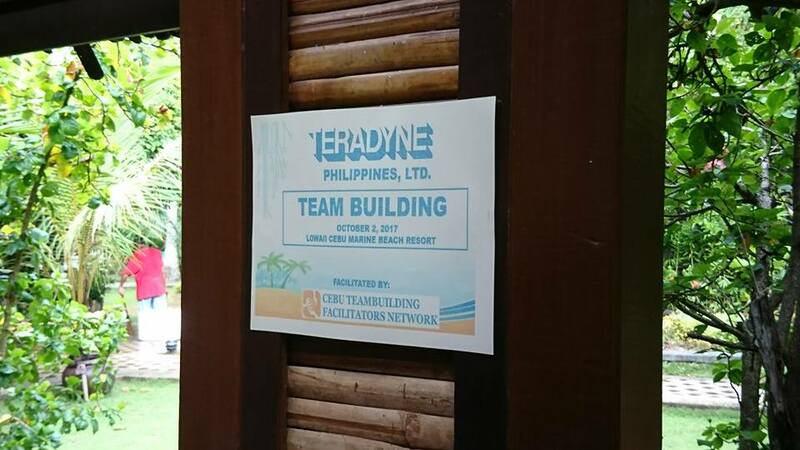 The Teradyne team learned a lot of things throughout the day, but the truth is that the real challenge starts at the end of the team building seminar. It is easy to say what we have learned but hard to actually apply it in real life. However, as long as we keep helping each other in the team, it is never just a dream to make things happen. We closed the day with a great hug and the facilitators also got a hug from the participants. We, the facilitators were only with the participants for around 6-8 hours in the day but it was nice to feel that the participants treated us like we were part of their team. We were only with the Teradyne team for a really short period of time in their lives but we were able to make a mark in their hearts. It is exactly as Plato said, “You can discover more about a person in an hour of play than in a year of conversation”. Hello August! The team of Cebu Teambuilding Facilitators Network goes to Hidden Valley Wave Pool Resort on August 12, 2017. They were to facilitate a training program for Access E-Talk. Access E-Talk is an Online English School. They teach English lessons to Asian and European students. It was a rainy day for a team building seminar. So we stayed indoors for the duration of the training. The wet and humid weather did not dampen our spirits. The participants of Access E-Talk were brimming with energy to start a day of learning, relationship enhancement and team development. Many organizations reward the hard work of their employees in different ways, Some dole out gift checks. Others throw a lavish party. Once in a while, employees get promotions. Some receive bonuses. What about a vacation? Surely, a vacation is a great way to disconnect from the daily stresses of work. Or when done with colleagues as a team bonding experience, it can recharge one's appetite for the work that they do. Seeing that is but one of the joys a facilitator can have that money can't buy. One of the most memorable experiences I had was back in 2014 with an organization that has since folded up. Where that team building event was held certainly played a huge role to make it memorable. 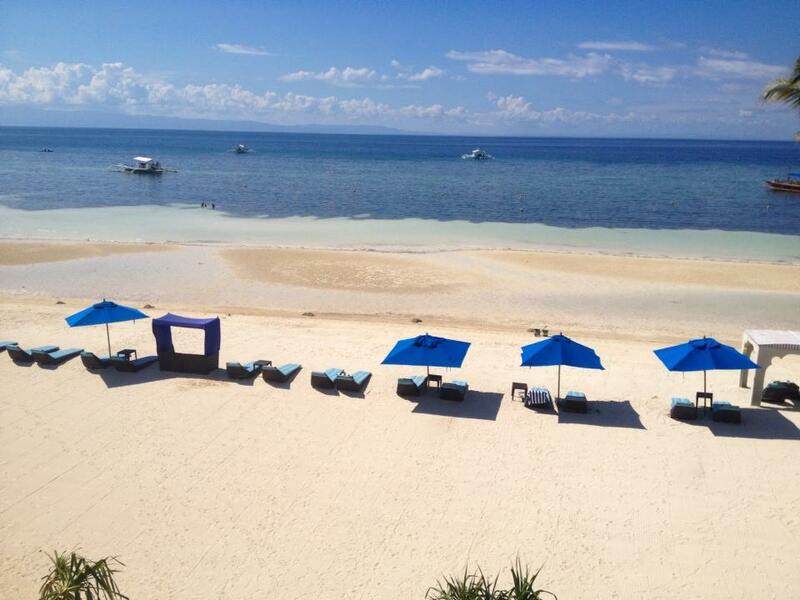 That April event was held at the Bellevue Resort in Panglao Island, Bohol, Philippines. And everyone definitely had a good time. Reminiscing that experience, let me share to organizations how they can pamper their hard working employees at Bellevue Resort in Bohol. The Bellevue Resort is right at Doljo Beach. Lounging by the beach surely takes stresses away. Take a dip in the crystal clear waters and immerse in the summer feeling. OutsourceSG is a business process outsourcing firm in Cebu City. Their main office in in Singapore. They offer outsourced voice, non-voice, and admin support to their business clients. OutsourceSG had their team building program on 6 July 2014. 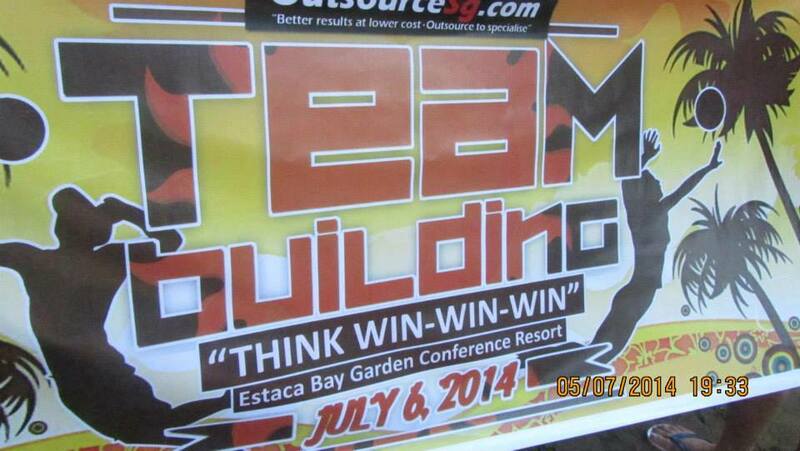 They tapped the services of Cebu Teambuilding Facilitators Network to do their team building program. The event happened at the Estaca Bay Garden Conference Resort in Compostela, Cebu. Cebu Teambuilding Facilitators Network (CTFN) conducted the team building seminar of Protect Marine Deck and Engine Officers Philippines Inc. last 19-20 August 2017. The training was done in Protect Marine’s training center. The center is located in Carcar City, Cebu. It was an awesome experience as we prepared our materials in their expansive training center. The training aimed to break communication barriers and increase the morale of the group. However, we were cheerfully greeted by the wonderful participants of Protect Marine. I've always felt thankful for organizations who deem their people as an investment rather regarding them as dead beat or worse, just another expense in their operations. In the ever changing dynamics of companies and organizations, for one, Teradyne has managed to have that as part of their culture: planting seeds of positive change in their workforce. As a team building facilitator, I have observed and learned a great deal about teams and teammates over the last years being in the corporate environment. And one of the powerful insights that I often share at such events is how to create team unity. I remember reading a proverb in Africa; "An army of sheep led by a lion can defeat an army of lions led by a sheep." Leadership as defined by the dictionary is: "the action of leading a group of people or an organization." And as such, the boys and I were at it once again in handling a leadership seminar for the Regional Business Unit Managers of Jollibee Mindanao. This happened last 28 July 2017 at Genesis Valley, Cabangahan, Consolacion, Cebu, Philippines. As part of the standard procedure for facilitating, we were there at least 12 hours before the designated time to setup this big event. With me were among the best and brightest from the Cebu Team Building Facilitators Network: Nathaniel Juan Arong, the Deputy Operations Manager for Cebu Team Building Facilitators Network, and other affiliate facilitators for the group; Nicolo Nasol and Marc Julius Rizada. To start the day it was part of the program flow to learn basic tai chi to release negative energy and to absorb positive energy around the forested areas of Genesis Valley. We then progressed into an activity for leadership which was Hover Board, an activity involving teamwork but in this case we focused more on leadership followed by a lecture on leadership styles. We then had a colorful activity called minefield which followed a lecture about Hershey & Blanchard's situational leadership theory. Message relay is a widely used activity not only in team building events. It is popular even in parties. This particular post is dedicated to a variation of the message relay. We call it the Body Language Message Relay. Body Language Message Relay is a variation of the message relay wherein participants use only parts of their bodies to relay the word, phrase, sentence or paragraph given. This is different than the usual whispering of the original activity. Space hover boards is a team building activity that test team's and individuals level of creativity and initiative. It simply involves getting a team from point A to point B with the given parameters. We recreated this instruction set for space hover boards for our blog readers. Enjoy! July marks the start of the second half of the year. Activity tapered off a little bit as expected with the rainy season coming in and classes starting. Nevertheless, there are significant CTFN activities in July 2017. One of the biggest players in the Philippine fast food market has tapped the services of the Cebu Teambuilding Facilitators Network to conduct its team building event. 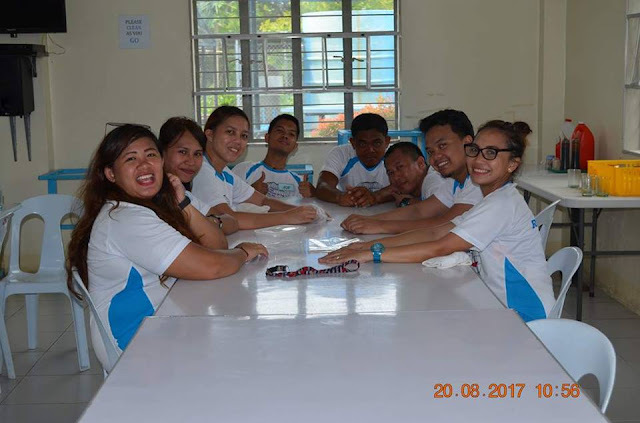 The Mindanao Regional Business Unit of Jollibee tapped CTFN facilitators to do their July 27 team building event at Genesis Valley Resort in Consolacion, Cebu, Philippines. One of the clients that the Cebu Teambuilding Facilitators Network did a program for in February 2014 was Treadtel Tires. Treadtel Tires is a Mandaue City-based wholesale tire distribution company that sources its products from around Asia, particularly from Taiwan, China, Hong Kong, Japan, and Thailand. It was founded in the year 2000. Their February 2014 team building event was held at the San Remigio Beach Club in Sitio Baybay, Barangay Tambongon, San Remigio, Cebu, Philippines. CTFN founder Thadz Engaling was accompanied by affiliate Kevin Johnrey Sosas to facilitate the event. It was a fun event that centered on learning sessions about team dynamics, improving team cooperation, achievement motivation, and action planning. One of the more popular team building venues in Metro Cebu is the Genesis Valley Resort in Cabangahan, Consolacion, Cebu, Philippines. This out-of-the-way mountain resort has wide spaces that can accommodate groups as large as 500. The Cebu Teambuilding Facilitators Network has done several training programs at this venue since its founding in 2012. In this post we identify the 5 spaces where groups can hold their team building activities at within the confines of the Genesis Valley Resort. The strength of a team derives from the integrity of its members. And so, the team from Harrison Miller and Schwartz renewed their commitment to one another as one team in their team building program held at Mountain View Nature Park at Busay, Cebu City, facilitated by Cebu Teambuilding Facilitators Network. Harrison Miller and Schwartz Corporation is a franchise premium dealer of Globe Telecomunications Inc. They have several branches within Cebu including Globe Robinsons Cybergate, Globe Parkmall in Mandaue and Globe Gaisano Carcar. "The Scavenger Hunt" is one type of team building activity that Cebu Teambuilding Facilitators Network provides with sheer mastery. Aside from hunting for clues and hidden treasures, this type of outdoor seminar challenges the participants to search for "stations" where a team marshal awaits to facilitate play-based learning exercises. In these Stations, the team can gain, not only points, but actual group-dynamics training, which will prepare and develop their competence for the challenges that lies ahead. It's one of the most exciting way for teams, especially for big ones (40 participants or more) to achieving the lessons they need to perform better. Except there's one requirement. The Scavenger Hunt necessitates a big venue in order to be done properly. 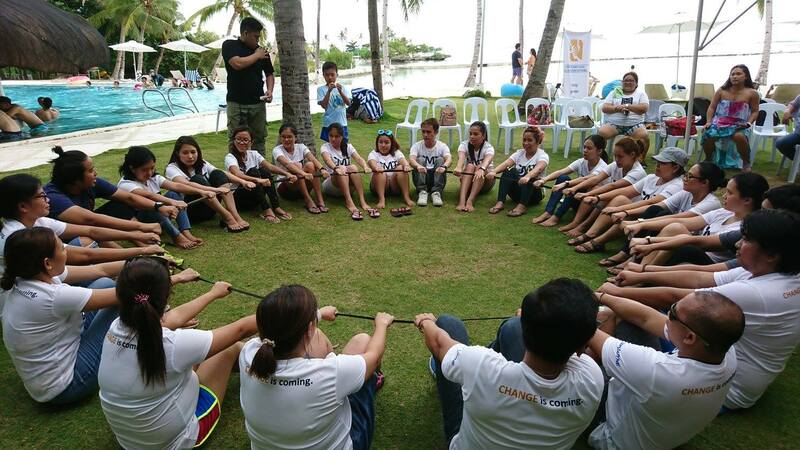 Back in May of 2014, Cebu Teambuilding Facilitators Network facilitated a team building training program for Autoliv. Autoliv is the world's largest automotive safety supplier, producing products that saves more than 30,000 lives each year and prevents 10 times more injuries. 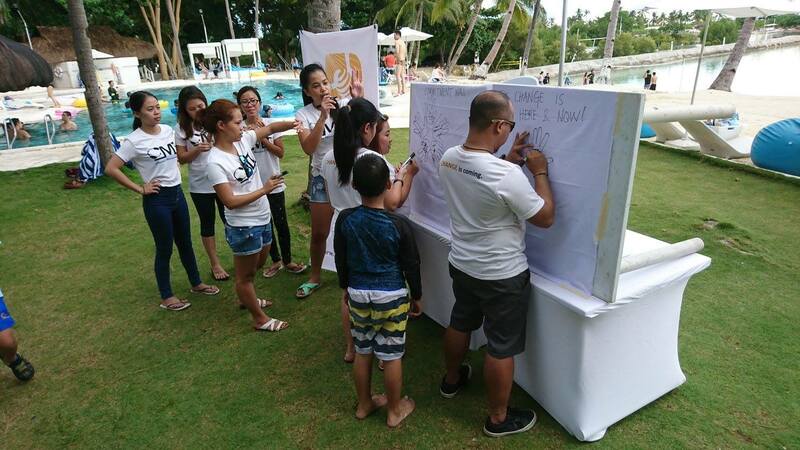 The team building training event was held at the Best Western Sandbar Resort in Sitio Bangbang, Alegria, Cordova, Cebu, Philippines. CTFN consultants present were founder Thaddeau Engaling II, Merie Joy Llenos, Marc Clint Maceda, Marc Julius Rizada, and Jihan Carmel Aguanta. The theme of the event was "I BuIld a Team". The theme emphasizes the role that an individual plays in the formation of successful teams. Anyone wanting to participate in team building activities will require a degree of focus to participate. The Concentration activity can give your team just that, in a fun and engaging way too! This is also a good activity for participants to remember the names of their colleagues. Be the last person to be picked out of the group. 1. Instruct the participants to form a circle. Let them do an Indian squat or let them sit on a chair. 2. Each participant will have a number, from 1, 2, 3, and so on. Or they can use their names for this activity. Be sure to maintain a consistent rhythm while doing these gestures. 4. After doing the chant, the first player has to say his/her number (or name), and mention another one within the group (eg. 1 - 4 or 1 – 12, or Chen-Kevin). Continue to perform the hand gestures during this process. 6. Anyone who breaks the Concentration cycle is taken out of the circle. Afterwards, repeat step 3. Alternatively, the person who broke the cycle may earn penalty points towards an agreed upon consequence instead of just being taken out of the circle. The Concentration activity is a great and fun way to build focus in any team building setting. I hope you enjoy the activity! After a record month in May 2017, the Cebu Teambuilding Facilitators Network welcomed June with renewed vigor and motivation. And our June figures weren't far off from our May results. For the 2nd time in 2 years, Cebu Teambuilding Facilitators Network implemented a team building module for Cemos Digital Productions. Last 3 June 2017, CTFN affiliate consultants Philipp Chen Tan, and Nicolo Nasol traveled to San Remigio Beach Club in northern Cebu to conduct the program for Cemos. Outside of Cebu City, one will find something good for the inside of the man. Travelling a good 2 hours south from Metro Cebu, you will find the landscape transform from imposing buildings to a canopy of trees. Cebu Club Fort Med Resort is perfect for those spontaneous adventurers who cannot decide which picturesque spot to visit first on this side of Cebu. Situated in Arbor, Boljoon, Cebu, Philippines, the resort is less than an hour away from Osmeña Peak, the whale shark interaction site and Tumalog falls to name a few. The resort itself is just in front of the national road and as a guest you can easily hop on a public transport to your next destination anytime of the day. The resort is also a few minutes away from the Eli rock. A leisurely walk in the afternoon will take you to the historical church of Boljoon.